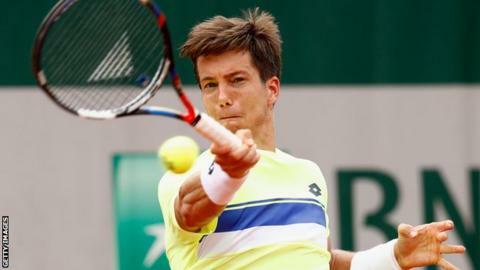 Aljaz Bedene was knocked out of the French Open in the second round by Jiri Vesely - but then said he "will fight" to represent Britain over his native Slovenia. The British number three lost 6-3 6-3 4-6 6-3 to Czech Vesely at Roland Garros on Wednesday. The 27-year-old then clarified earlier comments suggesting he might switch allegiance back to Slovenia. "I really want to play for Great Britain and I'm still hoping," he said. "I haven't really thought anything outside of that." Bedene became a British citizen in 2015 but has been unable to overturn a ban preventing him from representing Great Britain in the Davis Cup. After his first-round win on Monday, he said he hopes to play at the Olympics and to do so players must be available for the Davis Cup. "I read a few interviews, and I don't actually remember what I was saying because I get nervous," he added. "But until it looks like it's done, it's not done yet for me." Great Britain Davis Cup captain Leon Smith said: "As a player of course you want to the play at the Olympics - that's why we want to help and get him available for selection as those players already in the team are." Bedene's French Open campaign ended with defeat by Vesely over two hours and 52 minutes. The world number 52 started sloppily and, while he was able to win the third set, he had no answer to the tall Czech. The pair played out a 13-minute final game, but Vesely went through when Bedene hooked a cross-court shot narrowly wide. World number one Andy Murray and Kyle Edmund are now the only Britons left in the tournament. "I fought really well and I'm proud of that but disappointed to lose, especially after I thought I was better in the fourth set," said Bedene. "I have to learn from it, especially when those first two sets weren't great. "Then I played well and started to show myself that if I can play my game. I can beat those guys."